Do your New Year's resolutions include goals like healthy eating and regular exercise? Well, both of these require proper snacking! It's important to eat a snack or two a day if you want to stick to a healthy eating plan. If you go too long between meals you can end up famished, which makes it a lot more difficult to make healthy choices. Snacking keeps your blood sugar levels steady, so you're better able to control your cravings and make better decisions about what to eat. Additionally, snacking before a sweat session lets you work out longer and harder, so you're able to achieve your fitness goals more efficiently. 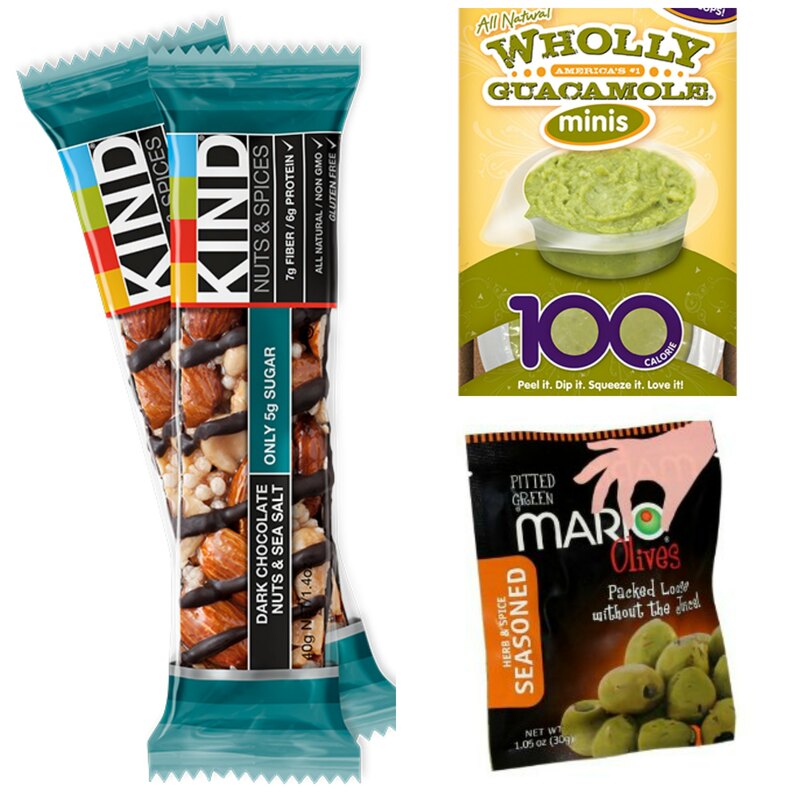 That said, here are seven nutritious snacks to carry with you when you're on-the-go. They'll help keep your hunger at bay throughout the day and give you energy when you need it. Happy snacking! This Dark Chocolate Nuts & Sea Salt bar is a sweet and salty blend of almonds, peanuts, and walnuts drizzled in chocolate with a touch of sea salt. Sounds delicious, right? For just 200 calories, you get 6 grams of protein and only 5 grams of sugar, and the flavor combination of sweet and salty are especially satisfying together. These 100-calorie, guacamole minis come in portable cups, so all you need to do is peel back the lid for some delicious dipping. Pair with baby carrots or rice crackers for easy on-the-go snacking. You can safely store these guacamole cups in your freezer for up to 3 months. For just 70 calories per serving, the Mini Babybel cheeses from The Laughing Cow are a great way to add some calcium to your diet (15% Daily Value) while consuming some some satisfying protein at the same time (5 grams). They also come in a firm casing, which is perfect for on-the-go snacking! These pouches provide you with a healthy olive snack without the mess. They come in a variety of flavors and make snacking on-the-go easy: just peel open the package and pop them into your mouth. One serving is just 100 calories and is equivalent to a single serving of fruit. When you're craving something salty, choose these sea salt-flavored almonds instead of potato chips. They're portion-friendly and provide a powerful punch of nutrition in every bite, including protein, fiber, and vitamin E. Be sure to keep these almond packs on hand when you need a quick bite. Lightly toasted and slightly sweet, these cereal "squarefuls" are loaded with whole grains and satisfying fiber to hold you over until your next meal. Snack on them around mid-morning to get you through to lunch or right before you hit the gym for sustained energy. Made with just two ingredients (dry roasted almonds and organic palm fruit oil), you can toss these travel-friendly nut butter packs in your purse or gym bag. Eat them straight out of the package or pair with a sliced apple or banana. One packet of the Classic Almond Butter provides 200 calories, 11 grams fat (2 grams saturated), and 7 grams of protein.